May I Assist You ? CIC – sometimes also called Completely-in-the-Canal (CIC), Canal-style devices are among the smallest hearing instruments. They hide within your ear canal, so they’re custom made to fit you exactly. There are several kinds of canal-style devices: A Completely-In-Canal (CIC) device fits the deepest within the canal; a tiny extension cord is used to place and remove the instrument. In-The-Canal (ITC) devices are slightly larger, so they extend farther out but remain very hidden. 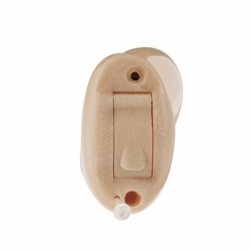 With an In-The-Ear (ITE) model, you will see some of the device’s face, depending on the size and shape of your ear.